These governments argue that to allow such objects to remain abroad as trophies only encourages the continued pillage of their national patrimony. Their position has won broad moral support and increasingly become the norm among academic archaeologists, who see ancient objects as historic artifacts inseparable from their place of discovery. It has forced major concessions from great museums around the world, including the MFA, the J. Paul Getty Museum, in Los Angeles, and the Metropolitan Museum of Art, in New York City. The British Museum is under persistent pressure to return the Elgin Marbles, its famous set of sculptures from the Parthenon. But as one museum after another negotiates deals, and prosecutors all over the world target the commercial trade in ancient objects, some prominent scholars are drawing a line in the sand, saying that objects belong where they are — that the movement is based on a false reading of history, and, if allowed to progress, could do serious damage to the world’s cultural inheritance. Police detained 25 Luxor residents yesterday for questioning about their involvement in clashes with police during a protest against government attempts to move the group from their homes to make room for an open-air museum, a security official said. The detainees are facing charges of "illegal gathering and vandalism," Omar Allameddin, the head of the local prosecutor's office, told the Associated Press.During a violent demonstration on Friday in the ancient Egyptian city of Luxor, police forcibly prevented hundreds of protesters from entering the Karnak Temple, one of the most famous sites from the Pharaonic era. Rome conquered Alexandria in 30BC. It was the only time that a single power dominated the entire Mediterranean basin. In one sense this was just another Roman conquest. But Alexandria is a special place: the cosmopolis for all races, countries, colours and creeds. Cultivated Romans saw their conquest as a seismic shift from Republic to Empire. For Alexandria influenced (and still influences) our poetry and urban architecture. Because of “wicked” Cleopatra, Romans perceived Alexandria as fascinating, but also dangerous. The city defied safe old Roman categories such as “Barbarian” and “Greek”. It was too modern for the Archaio-Con Romans — an artificial colonial capital that was also the gateway to a much older and more alien culture. The Aztecs, Mayans and ancient Egyptians were three very different civilizations with one very large similarity: pyramids. However, of these three ancient cultures, the Egyptians set the standard for what most people recognize as classic pyramid design: massive monuments with a square base and four smooth-sided triangular sides, rising to a point. The Aztecs and Mayans built their pyramids with tiered steps and a flat top. The ancient Egyptians probably chose that distinctive form for their pharaohs' tombs because of their solar religion, explained Donald Redford, professor of Classics and ancient Mediterranean studies at Penn State. The Egyptian sun god Ra, considered the father of all pharaohs, was said to have created himself from a pyramid-shaped mound of earth before creating all other gods. The pyramid's shape is thought to have symbolized the sun's rays. According to Redford, "The Egyptians began using the pyramid form shortly after 2700 B.C., and the great heyday of constructing them for royalty extended for about a thousand years, until about 1700 B.C." The first pyramid was built by King Djoser during Egypt's Third Dynasty. His architect, Imohtep, created a step pyramid by stacking six mastabas, rectangular buildings of the sort in which earlier kings had been buried. The largest and most well-known pyramids in Egypt are the Pyramids at Giza, including the Great Pyramid of Giza designed for Pharaoh Khufu. Thanks very much to Ingeborg Waanders for this link. I lived in the Netherlands when I was young, and it is amazing how much of this I could actually understand! De catacomben van het Egyptisch Museum in Caïro bevatten een rijkdom aan niet geïnventariseerde archeologische kunstvoorwerpen. De eerste vrouwelijke museumdirecteur in Egypte, dr. Wafaa El Saddik, heeft de spannende maar zware taak op zich genomen om samen met haar team uit te zoeken wat er precies allemaal in de kelders te vinden is. The Chairman of Sound and Light Company affiliated to the Ministry of Investment said that the company has decided for the first time to implement two projects of sound and light in Edfu Temple in Aswan, and in Abidos Temple in Sohag. The first project's cost hit LE 40 million and the implementation period will take two years while the second project's cost hit LE 30 million and will take 3 years. The chairman added that there is a plan for replacing and renewing the sound and light shows in Karnak Temple with a cost of LE 8 million and it is due to be inaugurated in next July. Also, the renewing of the sound and light shows in Al-Haram area is under-implementation at a cost of LE 6 million. The plan includes developing the shows in Abu-Semple and Feyala Temples in Aswan as of the next year. He said that developing the sound and light shows includes adding new light circles which give various numbers of colors and embodiment of light on the walls of temples, and a renewal in the dialogue for what has been discovered during the past years. In addition, the plan includes for the first time the establishment of a sound and light project in Hurgada on an area of 42.000 meters. He added that the company has finalized the project of lighting 16 Islamic monuments in Al-Moez Street in Cairo at a cost of LE 7 million, while the project of lighting the Citadel at a cost of LE 40 million is under-implementation. A new exhibition at the V&A will show the work and collections of Thomas Hope (1769-1831), one of the most influential designers and patron of the arts in Britain in the early 19th century. The exhibition will be on view through 22 June, 2008. . . . The exhibition will recreate the atmosphere of three rooms from the Duchess Street house, originally built by Robert Adam. Each room had a different character designed to appeal to all the senses. The V&A exhibition will show objects from one of the Vase Rooms which displayed Hope’s collection of ancient Greek and Roman vases; the Egyptian Room which combined ancient Egyptian antiquities with modern pieces of Egyptian inspired furniture; and the dramatic Aurora Room designed as the setting for Hope’s Aurora and Cephalus statue. To evoke the sensation of dawn the walls of this room were covered with mirrors edged with black velvet over which were draped curtains of black and orange satin. The exhibition will examine Hope’s creative talents from designer of interiors, furniture and metalwork to painter and writer. On public display for the first time will be Hope’s watercolours of classical sites and scenes of contemporary life from Greece, Turkey and Egypt, countries he visited on his Grand Tour. Another section will look at Hope’s numerous publications on architecture, design and costume. The heat wave that hit Egypt last Sunday did not deter Prime Minister Ahmed Nazif from going ahead with his planned two-day tour of Luxor to view the progress achieved so far with the project to develop the whole area, including the town itself, into an open air museum. The plans include more facilities and easier access for tourists. Luxor has been under major development since 2005 under President Hosni Mubarak's programme to improve services for the residents of Upper Egypt and to develop and promote tourist projects, which will in turn fuel the local economy and provide job opportunities. Buildings that encroached on ancient monuments were cleared, making way for excavations that revealed the full route of the Avenue of Sphinxes, once the royal path between Luxor and Karnak temples. After three years of makeover, Luxor is looking more alluring than ever. New houses and shops have been built to replace those that were forcibly demolished. All the buildings along the Corniche have been repainted in earth colours, and the city's streets and squares have been given a facelift, including the planting of large numbers of trees and flowers. Researchers have suggested that the process of building the Egyptian pyramids was not as colossal an undertaking as is generally believed. For centuries, people have theorized how the great pyramids were built. Some have suggested that they must have been constructed by extraterrestrials, while others believe the Egyptians possessed a technology that has been lost through the ages. But, according to Donald Redford, professor of Classics and ancient Mediterranean studies at Penn State University, the process of building pyramids, while complicated, was not as massive a project as believed earlier. Estimates suggest that between 20,000 and 30,000 laborers were needed to build the Great Pyramid at Giza in less than 23 years. By comparison, Notre Dame Cathedral in Paris took almost 200 years to complete. New evidence of a sick, deprived population working under harsh conditions contradicts earlier images of wealth and abundance from the art records of the ancient Egyptian city of Tell el-Amarna, a study has found. Studies on the remains of ordinary ancient Egyptians in a cemetery in Tell el-Amarna showed that many of them suffered from anemia, fractured bones, stunted growth and high juvenile mortality rates, according to professors Barry Kemp and Gerome Rose, who led the research. Despite leaders’ best intentions, and contrary to common depictions of abundance and wealth, ancient Egyptians might not have had the most desirable conditions or lifestyles. Art records from the city of Armana have long depicted prosperity, however new evidence reveals otherwise. Armana, Egypt’s capital for a brief period, may have had a deprived population under nearly unbearable conditions during the reign of Akhenaten, the ruler between 1379 and 1362 BC. Armana is the only ancient city in Egypt for which there are great details of its internal plan, but due to its unique creation and desertion its accuracy in regard to representation of Egypt is questionable. The city was abandoned no more than 10 years after Akhenaten’s death. Studies of remains of ancient Egyptians in an Armanan cemetery conducted by Barry Kemp and Gerome Rose reveal a great deal about the cities’ population. Those who lived in Armana worked under severe conditions and were often sick and deprived. Studies of the bones show that many citizens of Armana suffered from fractured bones, stunted growth and anemia, and that mortality rates in children were surprisingly high. See the above pages for more. Late one afternoon, after touring the pyramids here, we rushed to get a vantage view as the sun, a huge peach-colored ball, began to set. For a brief moment it seemed to balance itself on a long stone ledge between the great pyramids of Khufu and Khafre, hanging there perfectly still. As the sun sank into the horizon, the outlines of the pyramids--the tallest soaring to a height of 146 meters and which can contain several cathedrals--etched against the rose-colored sky, highlighting their stark simplicity and imposing grandeur. The pyramids have been called the "perfect form." I have seen few scenes more beautiful than the setting sun over the great pyramids at Giza. Later that evening we took in the light and sound show there, which spoke dramatically (aided by today's electronic technology) of the 30 dynasties of pharaohs--how they lived, loved and warred, and sought to defy death itself with their fabulous tombs. It was decidedly the best light and sound show I have seen. Egypt is not the easiest country to tour. Cairo is noisy and dirty in many places and Egyptians always seem to be quarrelling even when they're not. Drivers here are far worse than Manila's, with little regard for traffic regulations, other vehicles, or life and limb. Vendors are often pushy; cab drivers are equally pesky, especially since the old and dilapidated taxis have no meters and tourists have to bargain hard to prevent a rip-off. But perhaps the most pesky for tourists is the baksheesh, the local term for tips, and here Egyptians are hands down worse than the New Yorkers. Then too, at this time of the year, the heat is blistering. Yet, despite all these, one has to see Egypt at least once. One's cultural education isn't complete without seeing its great monuments--the products of an ancient superior culture that's seven millennia old (beating ancient Greece and Rome by several millennia). Even the ancient Greeks considered Egypt the "cradle of civilization." Karine Gadré vient d'achever sa thèse de doctorat au Laboratoire d'Astrophysique de Toulouse-Tarbes - Observatoire Midi-Pyrénées, consacrée à l'archéoastronomie ou histoire de l'astronomie, en travaillant plus spécifiquement sur l'astronomie en Egypte ancienne. L'archéoastronomie, dans le contexte de l'Egypte ancienne a abouti à la révision des dates de début de règne de plusieurs pharaons, à la cartographie des constellations peuplant le ciel méridional de l'Egypte ancienne, et à la formulation d'une toute nouvelle hypothèse orientationnelle concernant les pyramides de l'Ancien Empire ainsi que les temples d'Isis et Hathor de Dendérah. Karine Gadré a fait, sur l'excellent site Canal académie, un exposé qui lui a permis de présenter la démarche adoptée pour résoudre ces problèmes (constitution de bases de données archéologiques et stellaires, conception de modèles de visibilité d'étoile à l'oeil nu, application de critères astronomiques et égyptologiques), ainsi que les résultats obtenus. Ce travail a ainsi permis de dresser la cartographie du ciel méridional de l'Egypte ancienne. Il a également permis d'affiner les dates de début de règne de plusieurs pharaons (Sésostris III, Amenhotep I et Thoutmosis III), de mieux connaître la division du temps en heures, etc. L'émission (en Français) est téléchargable gratuitement sur le site. Karine Gadré has just finished her doctorate thesis in the Laboratory of astrophysics of Toulouse-Tarbes - Observatory South of France - Pyrenees, dedicated to archeo-astronomy or history of astronomy, while working more specifically on the astronomy in ancient Egypt. Archeo-astronomy, in the context of ancient Egypt led to the revision of the start dates of reign of several Pharaohs, to the cartography of the constellations populating the southern sky of ancient Egypt, and to the formulation of a very new orientational assumption relating to the pyramids of the Old Kingdom as well as the temples of Isis and Hathor of Denderah. Karine Gadré made, on the excellent Channel Academy site, an exposition which allowed her to present the steps adopted to solve these problems (the formation of an archaeological and stellar database, conception of models of stars visible to the naked eye, application of astronomical and Egyptological criteria), as well as the results obtained. This work thus made it possible to draw up the cartography of the southern sky of ancient Egypt. It also permitted the refining the dates of beginning of reign of several Pharaohs (Sesostris III, Amenhotep I and Thutmosis III), to better know the division of time in hours, etc. The broadcast (in French) is free telechargable on the site. We may sometimes classify misunderstood facts as being mysterious. I think that has been an important factor in the study of ancient Egypt. When skilled Egyptologists and archeologists are confronted with mega monuments that have no historical data to explain their existence they must use their research to come up with answers. They are very good at it but with no actual facts by which to compare results there is no sure way to know what the truth is. This leaves the door ajar for a lot of second-guessing and speculation. It also creates a fertile ground for debate. 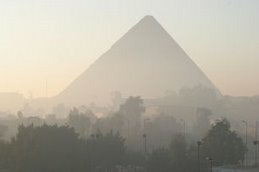 I have been very interested in the large pyramids on the Giza plateau for many years. I had the opportunity to read many books on the recreated history of Egypt and what has been offered as the background on these large pyramids. My view of the facts was self-published in my book, Egypt's Great Pyramid of Knowledge, in 2007 by Author House, and is available for sale on the Web at many bookseller sites, including Amazon.com as well as at www.authorhouse.com. My primary point in the book was to build the Great Pyramid from the ground up using tools that I believe the Egyptian's would have, or could have, had available to them. In so doing I felt it was important, for the first time in print, to explain those items in the pyramid that have previously been described as mysterious or unexplained. If you are asked for a username and password, enter egyptnews in both fields. When archaeologists excavated brick tombs outside a ceremonial site for an early king of Egypt, they expected to find the remains of high officials who had been sacrificed to accompany the king in his posthumous travels. No other animals have ever been found at such sites. Even at the tombs of the kings themselves, the only animals buried alongside were ones full of symbolism like lions. But at this funerary complex, overlooking the ancient town of Abydos on the Nile about 300 miles south of Cairo, the archaeologists discovered the skeletons of 10 donkeys that had been buried as if they were high-ranking human officials. “They were very surprised to find no humans and no funerary goods, and instead to find 10 donkeys,” said Fiona Marshall, a professor of archaeology at Washington University in St. Louis. See the above page for more, with photograph. This exhibit promises to feed the fascination. Objects and artwork ranging in age from the early Egyptian history to the late Roman period provide a view into the lives of both royal and ordinary Egyptians. The exhibit is not simply an overview of ancient Egyptian culture, though. It also places that culture within the context of its early investigators, the amateur and professional archaeologists who both explored it and, in their own way, preserved it. The history of Egyptology, the study of Egypt, is relatively recent, with its beginnings in the late 19th century. The real world of the early archaeologists working in the field was only slightly less swashbuckling than the fictional world of Indiana Jones or Amelia Peabody, the main character of Elizabeth Peters’ popular mystery novel series. The lives of William Flinders Petrie and Amelia Edwards were hardly less exciting. Excavating Egypt is pulled from the collection of the Petrie Museum in London. Founded by Amelia Edwards, the museum houses material collected by both Edwards and Petrie. Culture Minister Farouk Hosni named the first antiquities excavation team under Dr. Zahi Hawas Secretary General of the Antiquities Supreme Council to operate in Valley of the Kings in Luxor to unearth a number of tombs of kings and queens including Ramses the Second and Thutmose the Second. Dr. Hawas said the unearthing of those tombs would be regarded as the most important discovery since that of Tutankhamen tomb, especially as the excavation operations in the western bank was monopolized by foreign missions. The Kings Valley included 63 royal tombs unearthed by foreign archaeological missions, Hawas added. It was the pivotal moment in an ancient soap opera, one marked by intrigue, romance, betrayal and widespread consequence. The Battle of Actium in 31 B.C. was an epic showdown that pitted Mark Antony and Cleopatra against spurned former ally Octavian. When Octavian eventually reigned supreme in battle, it meant the end of the Roman Republic for good and the beginning of the Roman Empire, whose influences were ultimately felt throughout the world. Antony's colossal defeat also led to his and Cleopatra's Shakespearean double-suicide, providing plenty of movie fodder 2,000 years later. Archaeologists in Egypt have found a giant statue of an ancient queen at the site of two already huge Colossi of Memnon in southern Egypt. Reports indicate that the statue represents Queen Tiy, the wife of 18th dynasty Pharaoh Amenhotep III. It is approximately 12 feet tall (3.62 meters). The entire site is expected to be excavated over the next five years, archaeologists said on Saturday. The colossi's twin statues stand at the entrance to the road that leads to Luxor's famous Valley of the Kings. Minister of Culture Farouq Hosni told reporters that the discovery is a "formidable" enterprise and the ministry expects both statues will be erected for public viewing next year. They will be part of an "open air museum," he said. Egyptian and European archeologists on Saturday announced they had discovered a giant statue of an ancient pharaonic queen on the spectacular south Egypt site of the Colossi of Memnon. The statue represents Queen Tiy, the wife of 18th dynasty Pharaoh Amenhotep III, and stands 3.62 metres high (almost 12 feet). It was discovered around the site of the massive Colossi of Memnon twin statues that command the road to Luxor's famed Valley of the Kings. Two sphinx representing Tiy and Amenhotep III as well as 10 statues in black granite of the lion-headed goddess Sekhmet, who protected the pharaohs, we also found by the archeologists and presented to reporters and senior officials. Prime Minister Ahmed Nazif held a series of meetings 22/3/2008 with the ministers in Luxor to implement the country's plan towards comprehensive development, ending the citizens' suffering and providing new job opportunities for the Upper Egypt's youth within the framework of the plan aiming at turning Luxor to an open museum. During the first meeting, the Investment Minister Mahmoud Mohieddin explained the Ministry's plan concerning Al-Toud Plateau which is expected to be turned to 4500 hotel units at a cost of $ 450 million. At the same time, Nazif agreed to establish two industrial zones; one for light products and the other for the various products. During the second meeting, Nazif discussed with Minister of Communications Dr. Tarek Kamel the steps of implementing an electronic gate for Luxor City through the internet at a cost of LE 7 million. During the third meeting, Nazif agreed on starting immediately in implementing the project of lighting the West Bank which will be financed by Culture Ministry at a cost of LE 52 million. Moreover, Nazif watched a recorded film about the dimensions of the project which is currently implemented on an area of 6 KM as well as the developments of sound and light in Al-Karnak Temple. During the fourth meeting, Farouk Hosny, the Culture Minister displayed the ministry's plan which is currently implemented in Luxor, in addition to the great discoveries by the Egyptian-German mission of 7 statues of the god of war and 2 statues of Sphinx as well as a statue of Amenhotep III. A big statue of King Amenhotep III has been discovered by an Egyptian-German archeological mission in Luxor, said an Egyptian official on Friday 21/2/2008. The mission succeeded in collecting 100 pieces of another statue of Amenhotep III, Luxor Antiquities Director Mansour Borayek said. Led by Egyptologist Horig Sourouzian, the mission unearthed two heads of Sphinx in addition to seven statues of goddess Sekhmet on the western bank in Luxor, he added. In Egyptian mythology, Sekhmet was originally the warrior goddess of Upper Egypt. She is depicted as a lioness. Amenhotep III was the ninth pharaoh of the 18th Dynasty. He was the son of Thutmose IV by Mutemwia, a minor wife of Amenhotep's father. From quilts to Chihuly glass, the next two years of exhibitions at the Columbus Museum of Art will be packed with fare that goes beyond traditional paintings and sculptures. A schedule extending through March 2010 has been crafted to include a mix of rare, scholarly and instantly recognizable works, chief curator Catherine Evans said. . . .
"To Live Forever: Egyptian Treasures From the Brooklyn Museum," Feb. 13 to June 7, 2009 -- Drawing from the Brooklyn Museum's vast collection of Egyptian monuments and objects, the exhibition will feature more than 100 pieces that illustrate the ancient civilization's view of death and the afterlife. "The oldest object is from 1185 B.C., the most recent is from A.D. 100," Evans said. The artifacts in the new exhibit at the Museum of Idaho are so old, valuable and fragile that making cases good enough to protect them was so expensive, the exhibit almost was canceled. That didn't happen - acceptable cases were purchased from a university and modified - and the ancient artifacts comprising the "World of the Pharaohs" exhibit attracted more than 10,000 visitors in its first two weeks. The Idaho Falls museum is the exhibit's only venue in the Western United States. It will be there through November before continuing on to Ottawa, Canada, and two more U.S. stops during its four years on tour from Boston's Museum of Fine Arts. "It's the most expensive exhibit we've ever had," Museum of Idaho Program Director Nick Gailey said. "It's also one of the most impressive." Why a flood of new archaeological discoveries? Many of you may have questioned why, suddenly around this time of the year, a flurry of archaeological discoveries appears in the press and on television. Well, forget your conspiracy theories; there is a reason and it’s due to the almost unique way in which archaeology is practised in Egypt. Egyptology and Egyptian archaeology are still overwhelming dominated by foreigners — the subject itself is a product of a colonial era. However, this is changing. Encouraged by leading Egyptian archaeologists the youth of Egypt are beginning to engage with the study of their past in increasing numbers. We steer away from the subject of the glut of new discoveries somewhat, yet an understanding of the present situation is needed. Within the boundaries of Egypt, the body assigned the legal responsibility for the protection of antiquities, the oversight of archaeological excavations and the management of heritage sites (defined as anything over 100 years old), is the Supreme Council of Antiquities (SCA). The SCA is a department within the Ministry of Culture (MOC), headed by a Secretary General, a position now occupied by Dr Zahi Hawass. At this point, it would be useful to consider a brief potted history of the SCA. The Supreme Council was formed during the colonial era in 1858, when it was originally called the Service des Antiquites, at which time it was run mainly by the French, and had control of all archaeological excavations in the country. After partial Egyptian independence in 1922, the service was increasingly brought under the control of Egyptian government officials and was finally renamed the Egyptian Antiquities Organization in 1971. Egypt's nominee for the United Nations Educational, Scientific and Cultural Organization (UNESCO) top post has said that he intends to start his promotion campaign later this year. "Many Arab, European and Latin American countries have expressed initial support for me," Farouk Hosni, the Culture Minister, told reporters Thursday. He said his campaign will focus on his plans to develop work inside the organization especially in connection with its programs for education, women and peace. Last September Hosni expressed fears that the Arabs could miss out on a chance to land the much-coveted international position by fielding more than one nominee, thus risking a vote breakup. He called for an Arab consensus on one candidate for the prestigious UNESCO post. Morocco has repeatedly confirmed its unwavering intention to nominate its ambassador to the UNESCO Aziza Bennani as a candidate for the post of the director general of the Paris-based organization. The elections for the UNESCO post are scheduled for October 2009. Egypt threatened on Thursday to remove its antiquities from a Swiss exhibition unless the gallery withdrew a parallel show of photographs that Cairo thought made Egypt look dirty. Government antiquities chief Zahi Hawass said he faxed the ultimatum on Thursday to the Pierre Gianadda Foundation in the Swiss town of Martigny, where an exhibition entitled Offerings to the Gods of Egypt opened on Monday. If the foundation did not comply, Hawass's Supreme Council of Antiquities would boycott the foundation and send no antiquities to any Swiss exhibition indefinitely, he told Reuters. The Egyptian government does not control most of the ancient objects on show because they come from the Metropolitan Museum of Art in New York but it can withdraw the four items it did contribute, he said. Two Clemson University professors could play a role in landscaping paths where pharaohs once trod. Hala Nassar and Robert Hewitt will join their counterparts from Ain Shams University in Egypt on Saturday to propose to Prime Minister Ahmed Nazif a plan to restore and rejuvenate two temples and the Avenue of the Sphinxes in the city of Luxor. The plan includes a waterfront on the Nile River. Restorers and archaeologists have been working on the Roman necropolis to clean, consolidate and restore the tombs, which are embraced within a rocky, table-top mound. The 300 tombs are gouged out of the rock, all unpainted tombs except for two. These, the tombs of Petosiris and Sadosiris, are certainly the most interesting, with walls vividly- painted with scenes combining ancient Egyptian and Roman deities at one time. The tombs were discovered in 1972 by Egyptian archaeologist Ahmed Fakhry, who because of the paintings called them Al-Muzawaka. The walls of Petosiris's tomb are painted with fair-haired, Roman- nosed figures in Pharaonic poses, curly-haired angels. On the ceiling is a zodiac with a bearded Janus figure. The owner of the tomb is also featured on the back right-hand corner, standing on a turtle and holding aloft a snake and fish -- a curious amalgam of Egyptian and Graeco-Roman symbols. The wall paintings of Sadorisis's tomb show the deceased in positions with various deities: before Anubis while his heart is weighed; before Osiris while he is judged; and with Janus looking back on the deceased's life and forward into the hereafter. Harvesting scenes are depicted in both tombs, as well as some agricultural products of the oasis such as grapes and olives. While the other tombs in the necropolis are unpainted, they were found still with embalmed corpses. More than 10 years ago, when I was teaching Egyptology courses at UCLA, Lisa Truitt of National Geographic came to see me about an IMax film entitled Mysteries of Egypt, which they were planning to produce. I told Lisa that I wanted Omar Sharif to be the narrator. I wanted Sharif and I to work together on this film. When Lisa met Sharif, he immediately agreed to be the narrator and offered to do it for nothing. But, Lisa said no, and insisted on paying him. She told me that if they did not pay the actor it could end up costing the production company more. If one morning Sharif decided not to get up and come to the set, she explained, this would cost the production company because they would still have to pay for the cameras and crew. They therefore had a strict policy to always pay the actor a salary. We met many times during the film's production to discuss the details. When Sharif used to come to Egypt, the press chased and hounded him, trying to get an interview. Sometimes they made him angry by asking stupid questions, or they would exaggerate and insinuate things in their questions. One day Amal Othman, who at that time was a reporter for Akhbar Al-Yom, wanted to meet him for an interview. She is a very intelligent and energetic person, and this is why she became the editor of Al-Negoum (Stars) magazine at such a young age. She asked me to contact Sharif because of our friendship and arrange the interview. I called Sharif and he agreed. Sharif thought that the reporter was a smart lady and asked good questions; it was a great interview. Later Othman wanted to do an interview with Sharif and myself. She thought that it should be an interview between a star actor and a star archeologist, which ended up being the title of the article. Othman convinced Sharif to do the interview at the Giza Pyramids and to visit the excavation of the tombs of the pyramid builders. This discovery is extremely important because it proves that Egyptians built the pyramids, not slaves, aliens or people from a lost civilisation. By now…. many of you may have noticed the absence of regular updates from me concerning our 2008 season at KV-63. In January, with my departure to Egypt imminent, I elected to keep a routine doctors visit and was surprised to discover I needed emergency abdominal surgery to alleviate some chronic intestinal bleeding. Now post surgery…I should hasten to add that I feel much better. However, factoring in the required six weeks of recovery time and the evaluation of some new medication it was necessary to [again] revise my departure date for early March. Until a few days ago there was still a faint glimmer of hope that we might salvage a shortened season for March-April. Unfortunately, Murphy’s Law intervened, as there has been considerable delay in obtaining my medicine that prevents the recurrent bleeding. Therefore, with great reluctance, it is again necessary for me to postpone our 2008 season. It is too early to give exact dates, but we are considering a season running from late 2008 through early 2009. Specific work dates will be made available on the website as we finalize our plans. During the remainder of 2008 we will strive to increase our treasury as the cost and amount of materials needed for the pending seasons is considerable. Many close friends, colleagues, and KV-63 staff members have remained quiet about my surgery out of respect for my privacy. Therefore, I appreciate everyone’s kindness, understanding and sincere patience during this problematic period. A ‘special’ thank you to Dr. Zahi Hawass and the SCA as they have been most understanding and sympathetic to the difficulties encountered in the quest to resume our work in the King’s Valley. It was an ordinary morning at Hammamat Pharaon (Pharaoh's bath), the mini-resort south of Ras Sedr on the west coast of Sinai where for centuries locals and travellers have enjoyed the spa waters of the natural hot spring. The water, smelling slightly unpleasantly of sulphur, bubbles from the rock inside a cave and flows down into the sea. In the cave, where the darkness is heavy with steam, clients were enjoying a soak in the rock bath, or else waiting their turn for a therapeutic treatment for rheumatism, skin diseases or other ailments. Meanwhile, an Egyptian archaeological mission from the Supreme Council of Antiquities (SCA) carrying out a routine cleaning operation in the area near the spring stumbled upon what is believed to be a fourth-century rock-hewn grotto decorated with Christian murals. Zahi Hawass, secretary-general of the SCA, said last week's discovery was the second cave of its type to be discovered in Hammamat Pharaon and was only 25 metres away from first cave, which was used one to two hundred years later. The entrance to the new cave was blocked by a large amount of sand, stones and rubble. By removing all the dust and debris the team uncovered a one metre high vaulted entrance, which allowed the excavators to surmise that it could contain a church altar similar to the one found at Abu Suwera in Al-Tor, the capital town of South Sinai. However, further excavation revealed that the cave was not a church but may have been used by Christian followers or monks during the fourth and fifth centuries, a time of schism in the Christian doctrine of the Roman Byzantine Empire, when they needed to practise their preferred religious rituals far from the eyes of the leaders of the official church. Site surveys carried out between 2005 and 2006 in the Aswan-Kom Ombo region of Egypt by the British Museum and the University of Rome “La Sapienza” revealed the presence of two cemeteries and a settlement in the locality of Nag el-Qarmila, north of Kubbaniya (Gatto& Giuliani 2006–2007, 2007). Th e 2007 fi eld season at the site of Nag el-Qarmila, directed by Dr. Maria Carmela Gatto, took place between January 24 and March 13. The purpose of this excavation was to rescue a Pan-Grave cemetery and two Predynastic/A-Group sites, all of which are in danger of being destroyed by building activities in the area. In addition to rescuing the sites, the overall research goals of the project were to defi ne the extent of interaction between Egyptians and Nubians in the region over time and to determine the location of the political boundary that existed between them. Th is report includes a summary of the excavation of the cemeteries and a discussion of the fi ndings of the preliminary in-fi eld osteological analysis performed by Pitre. Ancient artwork gathered at Martigny’s Gianadda Foundation reflects the complex relationships maintained between men and their deities thousands of years ago. Offrandes aux Dieux d’Egypte (Offerings to the Egyptian Gods), the latest exhibition at the Pierre Gianadda Foundation in Martigny (Valais) presents a unique collection of almost 70 statues, statuettes and objets d’art, some more than 4,000 years old. Made from copper, bronze and precious metals, such as silver and gold, the works of art cover a period of 2,000 years. They have been collected from around the world by New York’s Metropolitan Museum of Art, which has organized the show for the Gianadda foundation. The metal work, buried under temples amid troves of treasure, offers a fascinating glimpse into the social and cultural environment of the ancient Egyptians. There are statues of pharaohs and Gods to wonder at, as well as representations of animals – sheep and even a crocodile. For years it has been a quiet mystery in a glass case at the Walters Art Museum, where it rested a few feet from a 4,000-year-old coffin in what is known as the Afterlife Room. But Tuesday, the 5-foot, 2,900-year-old mummy traveled by truck to University of Maryland Medical Center for its first-ever CT scan to see whether scientists can learn more about it — including whether it is a he or a she. For the mummy and its retinue, the biggest challenge was the same one facing everyone negotiating Baltimore's midday traffic: getting there in one piece. "It's very, very, very fragile," said Regine Schulz, the Walters curator of ancient art and director of international curatorial relations. With that in mind, a crew of curators and staffers spent two painstaking hours packing the mummy in bubble wrap and tissue paper, then lowering it into a custom pine box, complete with foam bed, for the mile-long trip. Sudanese democracy advocates have launched a campaign in Washington to generate pressure upon the National Islamic Front government in Khartoum to stop construction of the Merowe dam at the fourth cataract of the Nile. “After attacking Christians in Southern Sudan and their fellow Muslims in Darfur, the Khartoum government is continuing its ceaseless campaign of arabization, this time against the Nubians,” Faith McDonnell, the director of the Religious Liberty Program at Washington’s Institute on Religion and Democracy, said on March 7. The Chinese-built dam will flood the Nile valley between the 4th and 5th cataracts to create a lake to support a 1,250 megawatt hydroelectric station. While UNESCO undertook an extensive campaign to rescue and record over 1,000 archeological sites in the 1960s before the Egypt began construction of the Aswan High Dam and Lake Nasser, no such campaign is being waged to preserve the remains of the ancient kingdom of Nubia, which will be covered by the man-made lake. Over 70,000 Nubians will be displaced by the flooding, and critics charge little provision is being made for their physical welfare or their cultural heritage. “Completion of these dams is going to wipe out an ancient civilization. The Nubians have a rich cultural tradition as ancestors of both the Black Pharaohs and the ancient Christian church. Their disappearance is a tragedy that we’re trying to prevent from happening,” Ms McDonnell said. A sitting figurine of an unknown person named Sebeh-Nef, dated around 2,300 BC, is pictured on Thursday during a preview of the exhibition “Beauty in Old Egypt — Desire for Perfection” at the State Museum of Prehistory in Dresden, eastern Germany. The statue, found at the Western Cemetery in Giza, is one of more than 400 original exhibits presented during the show running from March 14, 2008 to Jan. 4, 2009. Mrs. Suzanne Mubarak inaugurated Sunday 16/3/2008 Al-Arish National Museum which occupies an area of 17,000 Square meters and costed LE 40 million. Mrs. Suzanne Mubarak inaugurated as well the Al-Arish premises of the Women National Council, which costed almost LE one million, on the occasion of celebrations marking the Egyptian Women Day. The museum exhibits as well antiquities selected from the Nile Valley. The museum includes 1700 antiquity pieces, mostly Egypt has restored from Israel, in 1994 as they were stolen by the occupation troops in 1967 war. Culture Ministesr Farouk Hosney said that Al-Arish Museum was built as a part of Higher Council for Antiquities' plan to establish a number of regional and specialized museums. He added that the museum contains about 2000 pieces of antiquities, a huge statue of Thutmose III and photos showing the Christ's birth. Egypt and Russia signed a tourist cooperation agreement that will increase the number of Russian tourists and encourage joint tourist ventures. The document was inked by Tourism Minister Zoheir Garana and Head of the Federal Tourism Agency of the Russian Federation Vladimir Strzhalkovsky. Russia's third International Trade Fair for Travel "INTOURMARKET-2008" opened in Moscow Saturday with Egypt as the honorary guest. Russian Deputy Premier Sergey Yevgenyevich Naryshkin and Strzhalkovsky inaugurated the fair. Naryshkin who visited the Egyptian pavilion and met with Garana highlighted the deeply-rooted Egyptian-Russia relations at all levels, expressing deep admiration of organization of the Egyptian pavilion which was inspired by the great history of Egypt. “The number of Russian tourists was the highest in Egypt in 2007 as it hit 1.5 million,” Garana told Russia Today TV channel earlier Saturday 15/3/2008. Nefertiti's Tomb found? Sensational discovery in the Egyptian Valley of the Kings! Once again, a new tomb was discovered underneath the desert sands, as reported by the German-language MYSTERIES Magazine in its next newsstand issue. So far, the Egyptian Department of the Antiquities has kept silent about the exact location of this discovery. As MYSTERIES has now revealed exclusively on its webpage, the tomb, which was discovered in November 2007, is allegedly located in very close vicinity of King Meren-Ptah (KV 8). Could it be the last resting space of Ramesses VIII? Hardly, because the discovery appears to be a "stepped entrance" which points to a significant Amarna Ruler Tomb from the 18th Dynasty - possibly even to the legendary and elusive last resting place of Pharaoh Akhenaten or his wife Nefertiti! I will be away from an Internet connection as from today for the next two weeks, so the blog will not be updated. My apologies, but I will backdate the blog as usual on my return. Hopefully nothing astounding happens in my absence! At the same time, the blog will have its fourth birthday on the 28th March, which is a few days before I return. It is easy to keep track of the age of this blog because, for reasons now lost in the mists of time (or, more probably, the bubbles of Champagne), I started it on my 40th birthday. The blog is 40 years younger than me, but on some days it seems as though it has been around for most of my life! Many thanks to all visitors for continuing to visit - it is lovely to know that so many people share the same interest. I would also like to partiularly thank those people who provide a safety net for me by picking up some of my errors, typos etc. I am particularly busy at the moment so your help is invaluable. And not forgetting the excellent Google Alerts and Google Reader services. An Egyptian mummy kept on display in a provincial museum for nearly 80 years has been identified as a son of the powerful pharaoh Ramesses II. The 3,000-year-old relic was thought to have been a female temple dancer, but a hospital CT scan showed features so reminiscent of the Egyptian royal family that experts are 90 per cent sure it is one of the 110 children Ramesses is thought to have fathered. Tests showed that the mummy had a pronounced over-bite and misaligned eyes, akin to members of the 19th Dynasty, and his facial measurements were found to be almost identical to those of Ramesses himself. Experts believe that the mummified man died in his thirties between 1295 and 1186 BC of a wasting disease, likely to be cancer. Chemical analysis also showed that the body had been embalmed using expensive materials, including pistachio resin and thyme, the preserve of priests and royalty. The story of the royal mummy was uncovered by a team from York University who were filmed carrying out the tests for History Channel series Mummy Forensics. See the above page for the full story, including a photograph of the mummy. What was once a bright constellation in the universe of art and antiquities is disintegrating in an online auction, mouse-click by mouse-click, in a major step toward satisfying millions of dollars of an Akron collector's debt. The continuing fall of Bruce Ferrini from international prominence is being documented in real time, as eBay-style bids creep upward on 153 items, many of them ancient religious artifacts. A 2,800-year-old strip of linen mummy wrap, inscribed with text from the Book of the Dead. Current bid (as of Friday afternoon): $1. A Babylonian pottery vessel, approximately 3,800 years old, valued at $3,000 to $5,000. Current bid: $150. Ferrini owes some $5 million to a long international list of creditors. Mainly because of the eclectic nature of the collection and the controversy attached to its architect, this auction has been more than two years in the making. The assets were seized in late summer of 2005. Despite the quality of the goods, the major, mainstream auction houses shied away. The sale is being conducted by the Dallas-based Heritage Auction Galleries, with the items on view at Arte Primitivo Gallery in New York City. Online bidding will continue until the close of business Wednesday. Mme. Nakhla, our SCA Conservator, is cleaning this block that was burned heavily in antiquity. Betsy and Kent are also looking at it together. Other blocks around this one showed some slight burning evidence, but this once was intensely fired. It is an interesting puzzle for us to consider – when and in what conditions was this burning done? Thursday, February 28 was our last day of work. It has been a very satisfactory season. We accomplished most of what we set out to do, and more besides. Finding the footing of the Mut Temple’s 1st Pylon was particularly exciting, as was the successful restoration of Chapel D. We also found a new and interesting building in the last few days of work, described briefly below. Como era costumbre en la dinastía XI, la época en que vivió Iqer, los difuntos se depositaban dentro de los ataúdes de lado. El ataúd luego se colocaba de tal forma que el difunto estuviera mirando hacia afuera, en la medida de los posible hacia la salida del sol. Cuando levantamos la tapa Iqer yacía sobre su hombro derecho. La cabeza tenía una máscara de momia hecha de cartonaje y pintada. Sobre el costado se habían colocado dos grandes arcos y tres bastones. Celebrations marking the birth of the Prophet Mohamed, which this year falls on 20 March, are multi-faceted -- there are religious sermons and songs, the screening of classic films based on the life of the prophet, a preponderance of brightly coloured awnings to decorate the entrance to sweetshops. But it is in the sweetshops themselves that Egypt's most idiosyncratic contribution to the feast is to be found for among the heaped confectioneries, the piles of nuts and other sugar-coated delicacies, there will be rows of mulid dolls. The doll, fashioned from boiled sugar, first appeared during Tulinid times though its popularity only flourished during Fatimid rule, particularly during the reign of Al-Moez Ledin Allah Al-Fatemi. Typically, it is dressed in a Mameluke outfit, a waistcoat with fitted body and long, generous sleeves, the body covered in a full skirt that has the advantage of ensuring stability, posed often with hands on hip and with three paper fans attached to her back like wings. See the photograph on the above page. In ancient Egypt, the New Year began with the return of Sirius. It was, in fact, the "Nile Star" or the "Star of Isis" of the early Egyptians. Interestingly, some 5000 years ago, this "heliacal rising" (appearing to rise just prior to the sun) occurred not in August, as is the case today, but rather on, or around June 25. When they saw Sirius rising just before the sun, they knew that the "Nile Days" were at hand. Its annual reappearance was a warning to people who lived along the Nile River. The star always returned just before the river rose, and so announced the coming of floodwaters, which would add to the fertility of their lands. People then opened the gates of canals that irrigated their fields. Priests, who were the calendar keepers, sighted the first rising of the Dog Star from their temples. At the temple of Isis-Hathor at Denderah is a statue of Isis, which is located at the end of an aisle lined by tall columns. A jewel was placed in the goddess' forehead. The statue was oriented to the rising of Sirius, so that the light from the returning Dog Star would fall upon the gem. When the priests saw the light of the star shining upon the gem for the first time, they would march from the temple and announce the New Year. In the temple appears the inscription: "Her majesty Isis shines into the temple on New Year's Day, and she mingles her light with that of her father Ra on the horizon." The Egyptian Embassy is hosting Culture Week to showcase features of Egyptian culture. Deputy minister for foreign cultural relations, Salah Hassab Elnaby, said: “This year we decided to focus on cultural relations in Africa. Of course we started with the most important country on the continent, South Africa. “Besides the folk group of artists from northern and southern Egypt, we are going to share the drum philosophy ,” said Elnaby . “We believe drums can bring people together. Although considered to be of war, they can be used for peace. There will also be other traditional instruments like the rababa which looks like a violin. Both produce beautiful traditional sounds that take you to our stunning country. The language of music is international and can be understood by all. There is also an exhibition of Egyptian artifacts at the Cultural Museum in Pretoria. These go back to 3000BC and to the Greek-Roman era at 200BC. For anyone learning hieroglyphs I have put together a small site at the above address. Its sole purpose is to act as a directory of useful resources - there is a paragraph of explanation to accompany each link, and links are arranged by topic. If you have any additional links for me to add I would be grateful to receive them. Entitled "Christianity and Monasticism in Upper Egypt", this was the fourth in the series of Coptic symposia organised by Fawzi Estafanous to take place in a monastic setting. Although the smallest of the four such gatherings to date, it was lacking neither in spirit nor in the quality and diversity of the papers presented.